The Tornado is a challenging treat game for your pet! Place delicious treats or biscuits in the four rotating discs and let your pet find them. Suitable for dogs, cats, rabbits and ferrets. The Dog/Cat Tornado consists of four layers of independently rotating discs, placed on top of each other. Each layer has an opening for treats to be hidden in. All layers must be rotated using the paws or nose in order for them to find the treats, which provides endless fun. The difficulty level for the Dog/Cat Tornado is level 2. Please look here for more information about the games of Nina Ottosson. Please note: This game is suitable for all dogs, cats, ferrets and rabbits, regardless of age, breed and size. Make sure that this game is always given under constant supervision. 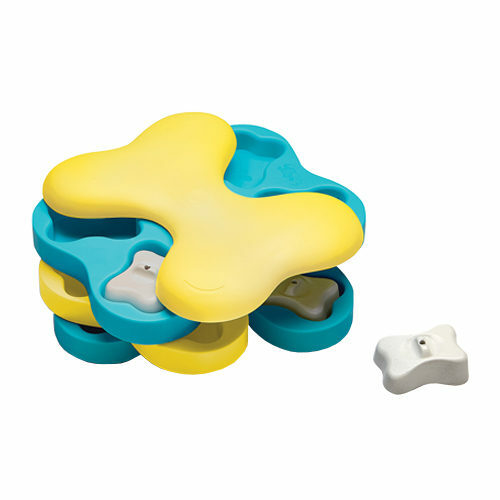 The Spinny is made of recycled plastic, which can easily be cleaned with water and soap, and is dishwasher-safe. Make sure there is no soap left in the game before giving it back to your pet. Have you used Nina Ottosson Dog/Cat Tornado before? Let us know what you think about this product. Brilliant toy - really makes my dog work to find the treats. It's his favourite toy. Definitely recommend. My dog really enjoys this toy and very quickly mastered how to get the treats out.